As the largest living mammal on earth glides effortlessly and elegantly through the world’s oceans, it soon becomes clear why they are revered for their sheer scale and their undeniable beauty. There are dozens of different whale species still in existence, each of which boasts its own unique anatomical features, habits and movements. Their awesome size is somewhat juxtaposed by the slow, quiet manner in which they swim and interact with one another. Whales are intriguing, not only for their size and stature, but also for their incredible adaptations to life in the deep, their living as mammals beneath the water’s surface and the intelligence for which they are well known. However, whales are facing the ever-present threat of extinction due to the loss of its natural habitat (since their clean ocean home is being polluted at an astronomical rate) and, more notably, hunting by humans that use the meat and blubber of the whale for a number of different purposes. Humpback Whale Breaching in the sunlight. Evolutionists believe that whales were once terrestrial animals of the artiodactyls order, which indicates that they were ungulates with an even number of toes. They are thought to have started entering the oceans some 50 million years ago, and then occupying them as a full-time habitat between 40 and 45 million years ago. It remains unclear what prompted them to move from the land into the water, and why the animals in the water did not evolve into whales, but are believed to have left the water and evolved into land animals. Still, these are commonly held beliefs. Whales belong to the cetacean family of animals, which includes dolphins and porpoises. This family is then divided into two suborders in regard to whales; namely, Mysticeti (whales with baleen plates instead of teeth) and Odontoceti (whales with strong teeth). They are mammals and fall under the subclass of Eutheria. Interestingly, the closest living relative of the whale is the land mammal, the Hippopotamus. Therefore, they are both classified under the super-order of Cetartiodactyla. Toothed whales and baleen whales are separated by the nature of their feeding mechanisms. Some whales require teeth in order to eat fish, squid, crustaceans and larger mammals (depending on their own size). The teeth are used to grasp and chew their prey effectively. Toothed whales include the Sperm Whale and the Killer Whale. Baleen whales, however, feed on plankton, and only require baleen plates in their mouth through which the water can be filtered and the plankton separated for eating purposes. They draw water and food into their mouths and then filter the food from the water by pushing it through their baleen plates. The Blue and Humpback whales are excellent examples of baleen whales. Baleen whales are larger than toothed whales. The largest living animal ever currently in existence, according to modern knowledge, is the Blue Whale; a baleen whale that can reach a length of about 33 metres or just over 108 feet. A single Blue Whale weighs about 180 metric tons. Interestingly, whales are born with some body hair. This all but disappears as they get older as it would hinder their swimming. Their horizontally-fluked tail enables them to move through the water with strong movements that, while not very quick, are effective in allowing the animal to cover long distances with minimal effort (unlike small fish that need to dart rapidly, change direction quickly, and so on). The fastest whales reach a top speed of about 30 miles, or 48 kilometres, per hour. These are Killer Whales and Shortfin Pilot Whales. Whales have a streamlined shape (as do most of the aquatic and marine animals known to man) so that they are able to glide through the water without an awkward body shape hindering them. This is referred to as a fusiform shape (tapered at the front and back). A thick layer of blubber just below the surface of the skin ensures that these warm-blooded animals are kept warm by providing essential insulation, even in the coldest ocean waters. This blubber is also a source of energy during breeding periods or times of increased travel and migration, when more reserves are required to help the animal not to succumb to exhaustion. Whales are mammals and, therefore, breathe by means of lungs, as opposed to fish that use gills and do not need to come out of the water for air. Whales can stay under the water without surfacing for air for several minutes. However, the key is not the amount of time for which they can hold their breath, but their physical adaptations for conserving the oxygen within their bodies. So, as they dip below the water’s surface, the heart rate drops to use less oxygen, the animal has more blood in its body (which means more oxygen) than other animals and human beings and its blood contains more oxygen-containing blood cells, proportionally, to ours. Their hearts have four chambers, as do human hearts. The Blue Whale’s heart is approximately the size of the original Volkswagen Beetle to enable it to be big and powerful enough to circulate oxygen-carrying blood to all parts of its enormous body. When it is time to take a breath of fresh air, the whale will travel upwards to the surface of the water to blast used air out of the blowhole on the tops of their heads and take in fresh air to last them another deep dive. This air is then carried to their heart and lungs in order to oxygenate the blood and, thereby, the organs too. Whales are also seen surfacing in order to make stunning displays out of the water. These displays draw people from all over the world to participate in whale watching, just to see them breach, which involves them lifting their massive bodies out of the water, spy-hopping (peeping out of the water), lobtailing (slapping their tails on the water’s surface) and logging (lying still just beneath the surface of the ocean, with only the top of their head and dorsal fin showing) in bold displays of their splendour. 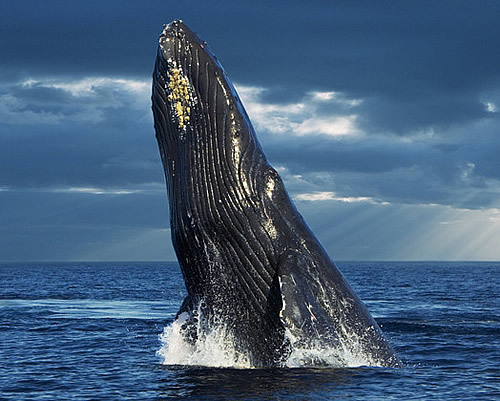 In certain places around the world, such as Hermanus in the Western Cape of South Africa, whale watching has become the main tourist attraction. Hundreds of thousands of whale enthusiasts visit these towns and coastlines to watch as the whales pass by and demonstrate the beauty and elegance for which they are acclaimed. Males are called bulls, females are called cows and their juvenile offspring are referred to as calves. Whales may mate with the same partner several times, but do not generally stick loyally to one mating partner for life. The intelligence and insight that whales possess is evident in the way that they socialise, or interact with others of their species. These animals have been known to mourn the loss of a fellow whale, teach their young life lessons, learn new behaviours, make plans with one another and make judgements based on previous experiences and knowledge. These are qualities that are characteristic of human beings and our mental capabilities, making whales even more fascinating to researchers and animals lovers as the gap between species closes. 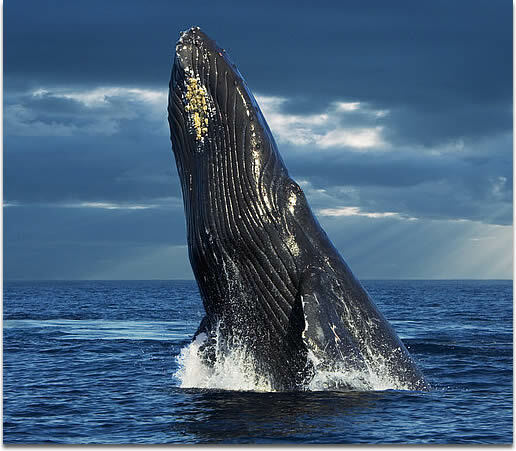 The life spans of whales depend very much on their specific species. Some whales live to around 40 years of age, while others may live for more than 100 years. Whales give birth to live calves every one to three years. These calves are nursed on thick, fat-rich milk from the mother’s mammary glands. This milk has to be high in fat as it is the calf’s only source of energy, nutrition and warmth. The ways in which whales communicate with one another have fascinated researchers for decades. Using what we have termed “whale songs”, these mammoth creatures communicate by means of high-pitched melodies that sound quite eerie to the human ear. These songs are usually unique to a specific group of whales, and can be taught to calves, thus carrying a certain song down from one generation to the next in a sort of tradition. 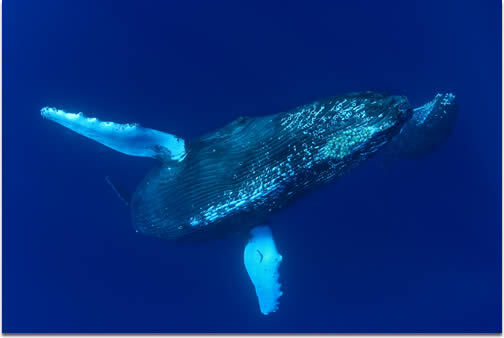 The famous song of the Humpback Whale can last for up to half an hour. Research has indicated that the songs have defined structures, including a type of chorus; a shorter part of the song that is repeated at regular intervals. In fact, certain groups of whales have even been shown to have established their own dialect when communicating to one another. These songs are used to communicate important information, signal aggression, woo potential mates and as a means of establishing direction and position via echolocation. In addition to songs, whales communicate by their body language, moans, grunts and thumps. Not only is the Blue Whale the world’s largest living animal, it is also the loudest. Sadly, whales have long been the victims of excessive hunting by human beings. They are valued for their meat as well as their blubber or oil, their baleen plates and even the ambergris of the Sperm Whale (used in the production of perfume). Ambergris is a waxy substance that is found in the digestive tract of the Sperm Whale. It is a biliary secretion that is believed to help tough food matter (such as the beak of a squid) to pass through the intestines without discomfort or damage to the whale. It is then regurgitated or secreted. Whales perceive sound through their lower jaw and throat, rather than through their ears. Whaling (as whale hunting is known) has made an enormous hole in the population numbers of various whale species around the world. In the decades before the anti-whaling laws were passed (in many, but not all countries), some species were almost completely wiped out. In fact, in the 20th century alone, more than 2 million whales were savagely slaughtered at the hands of human hunters. Today, there is little use for the oil and blubber (since we have cheaper, more modern supplements).Therefore, most whaling is conducted for the purposes of getting the meat and for unsavoury research purposes. The Common Minke Whale and the Antarctic Minke Whale remain the most hunted of all the whale species. However, whaling is not the only threat that these gentle giants face today. The presence of humans and boats can be extremely stressful to whales. In fact, when a lot of boats are around (such as during the peak whale watching season), it has been proven that the whales shorten their feeding time dramatically in order to escape the contact that they are being forced to have with humans. This is extremely detrimental to their physical health and emotional well-being. Other major threats include air and water pollution and fishing, since both of these interfere with the natural movements and diets of the whales. Whales are often caught in fishing nets and left to die as they struggle to escape. In addition, they ingest harmful foreign materials that are in the water as a result of littering or large-scale dumping. These poison them, block or damage their alimentary canal and lead to a painful, unnecessary death. There have been a number of whales in folklore, myths, legends and fairytales. Whales even appear in the Christian Bible. Contrary to popular belief, though, the famous prophet, Jonah, is said to have been eaten by a large fish and was, therefore, probably swallowed by a whale shark, and not a mammalian whale. Many environmental organisations are working hard now to preserve and propagate the valuable whales we have remaining in waters all over the world. Some of these organisations include the World Wildlife Federation (WWF), the International Federation for Animal Welfare (IFAW), the Whale and Dolphin Conservation Society, The Institute for Ocean Conservation Science, Sea Shepherd, Greenpeace and the International Whaling Commission, amongst others. Institutions like these play an integral role in educating local and global communities, implementing measures to curb the destruction of important species and even have important measures put into legislation. As always, funding is an obstacle to their being able to accomplish everything on their wish lists, and donations and volunteers are always needed, if their work is to continue.